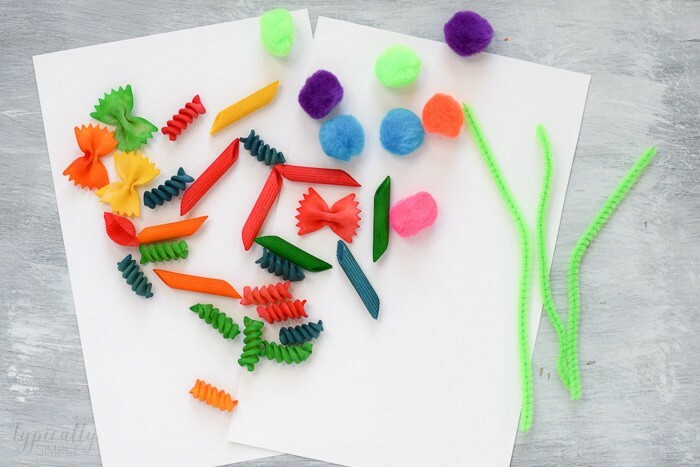 Colorful pasta noodles are perfect for making fun spring crafts for kids! 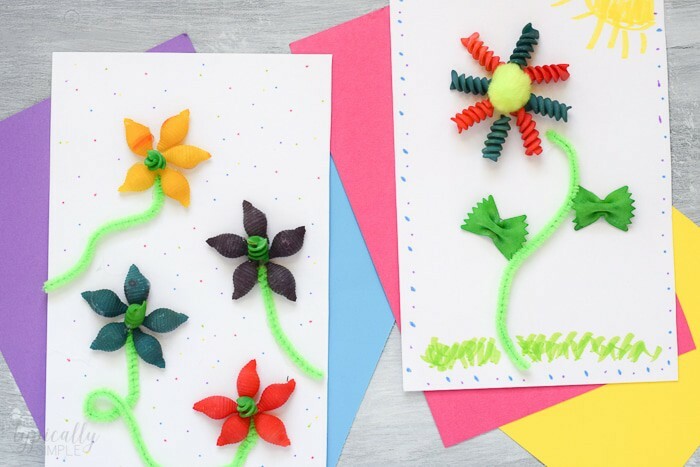 These cute pasta flowers will help welcome spring into your home without any mess in your home! Hi there! It’s Kelly from Typically Simple and I’m excited to be sharing a kids’ craft with you, especially since this one reminds me that spring is just around the corner! My little guy and I love to go on nature walks together to look for different types of flowers, butterflies, and insects. And I really enjoy using the outdoors as inspiration for spring crafts for kids, especially since there are so many bright colors and patterns that can be found in nature. It’s also fun to use different types of craft supplies for projects, rather than the normal craft sticks, construction paper, and paint. One of my favorites is using pasta noodles! Plus it’s fairly easy to dye batches of noodles to use for crafts! This is a great way to use up all those random boxes of noodles that are about 1/10 full…you know, those ones you are saving just in case you might need a handful of noodles! Please tell me I’m not the only one who has boxes of noodles like this in the pantry! This is a great project for giving the kids a little creative freedom! It’s not so much about the end product, as it is about the process. Go on a nature walk together to look for flowers, or use books and photographs as inspiration if the flowers aren’t blooming yet. Use this craft as an opportunity to talk about and create patterns with different shapes and colors of noodles. If you don’t want to go through the process of dying noodles, have the kids glue plain noodles onto the paper and then paint them! 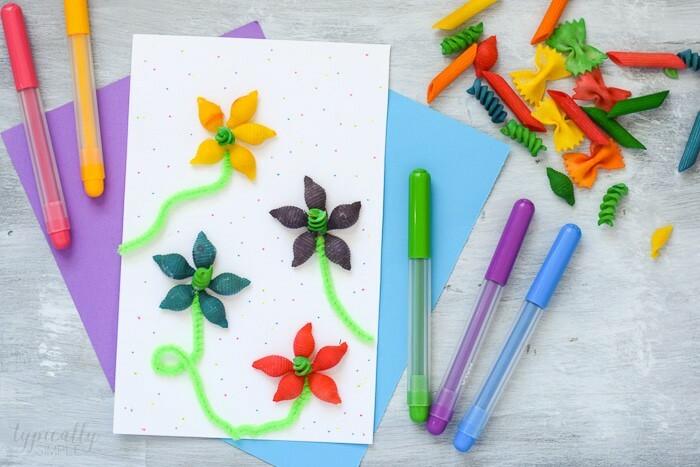 Turn the pasta flowers into cards for Mother’s Day! 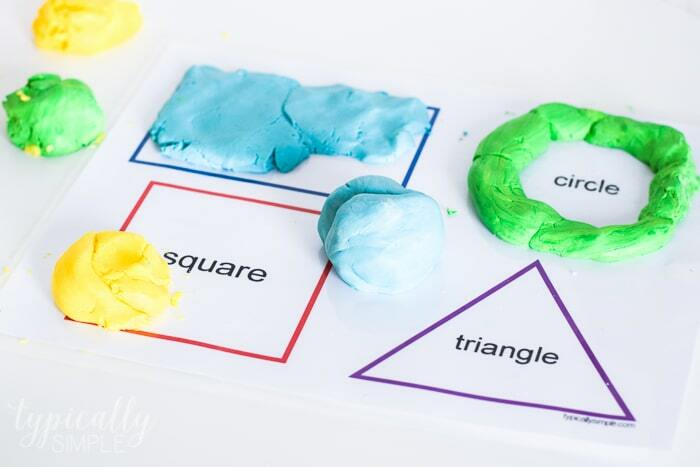 Just fold a piece of construction paper in half, have the kids decorate the front, and add a little message inside. And there you have it! 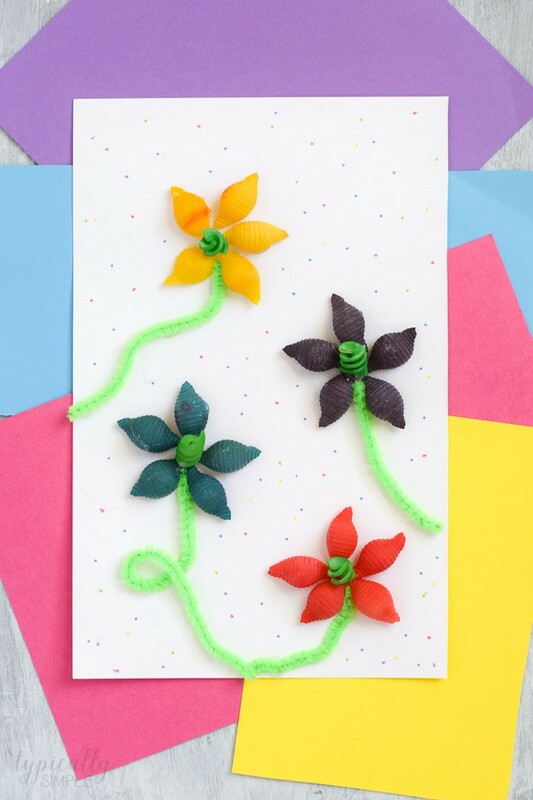 A super fun, spring inspired craft that is great for both younger and older kids! 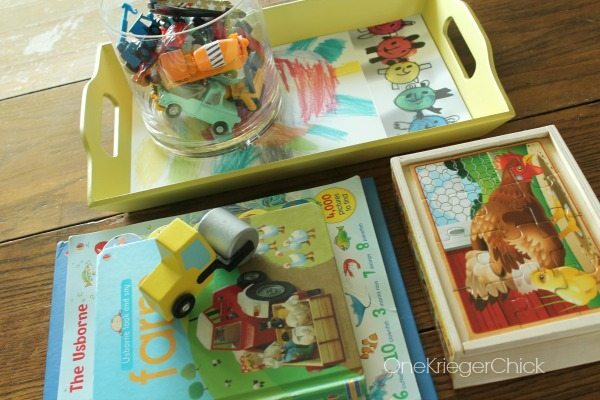 Plus it’s an open ended craft that will allow the kids to use their imaginations and creativity. I love sharing all types of spring crafts over on Typically Simple. Be sure to check out these Craft Stick Flower Pots! They make a super cute homemade Mother’s Day or Teacher Appreciation gift! 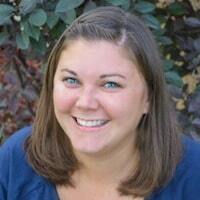 Kelly Meier shares creative inspiration for crafts, recipes, and kids’ activities on Typically Simple. Kelly is a former teacher, now stay-at-home mom and a lover of all things chocolate, grande lattes, and the great outdoors…minus the bugs. If you liked this Spring Crafts for Kids Project you might also like…. 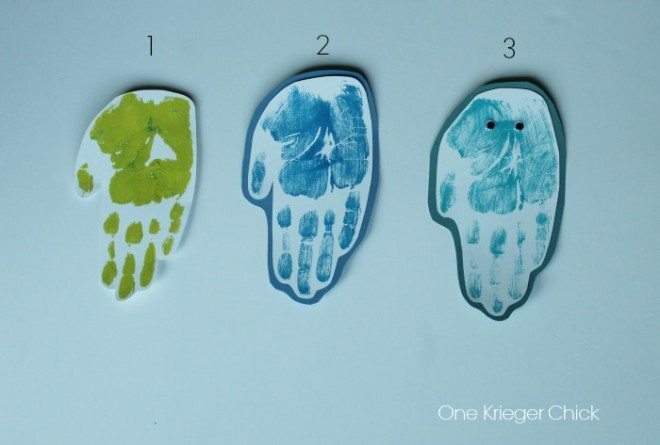 From left to right: Jellyfish Handprint Bookmarks, 2 Ingredient Homemade Playdough & Kids Art: Embellished Tray.